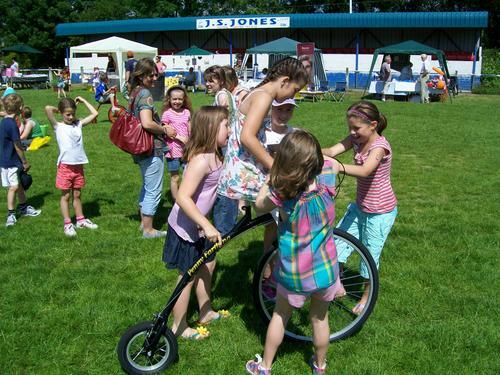 Circus Skills Workshops keep toddlers to teenagers occupied at Fetes and Family Fun Days! Outdoor events feature tightrope, trampolines, stiltwalking and novelty bikes. Other activities include diabolo, plate spinning and Jack in the Box table. Dressing up table with clown wigs, hats, bow-ties and red noses. Thank you so much for providing a brilliant range of activities for the children at our show. I believe many parents struggled to extradite their children from your activities for most of the afternoon. I trust that you had a good journey home.